We recognize that IT environments are not all the same. You may manage a small IT environment, without in-house support desks and require an IT infrastructure that can adapt to change rapidly. Or, you might be responsible for a large and complex environment, with mature processes already in place, and yet have limited resources for strategic support planning. Though the environments may vary, your IT needs are the same. You want to run efficient organizations, have insight into your operations and resolve issues quickly. Dell IT Advisory Services is a two-tier program that delivers proactive reporting and analytics to help IT managers reduce unplanned downtime and optimize operational performance and stability. Offered as two distinct packages – Essential and Strategic – Dell's IT Advisory Services can suit the unique IT needs of your organization, providing you with features and functionality focused on helping you identify problems and correct them before they occur. The service also allows for flexible payment options making it easier to budget and allocate funds. Provide a trusted advisor to help manage IT complexity. 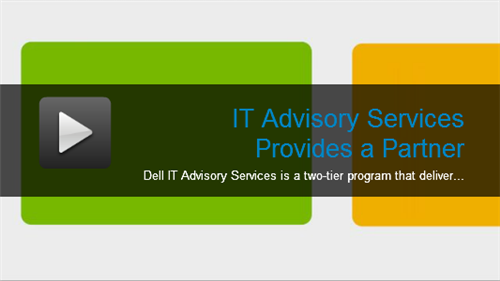 For more detailed information about Dell's IT Advisory Services – Essential or Strategic Package – please visit our web site at www.dell.com/itadvisoryservices or contact your Dell representative. We look forward to assisting you.